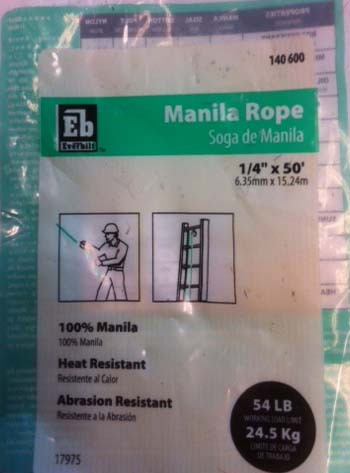 Get Pure Manila Rope and Don’t Be Fooled! Sure APPEARS to be manila! There was a volunteer who procured ten 50 feet x 1/4-inch packages of what was presented as 100% manila rope. He wanted to prepare the rope to be used for Scout pioneering projects and set about diligently pre-stretching each 50′ length, cutting each into various lengths for lashing, painstakingly applying a sailmaker’s whipping to each end, burning off excess hairs because the ropes were very hairy, and then color-coding the ends with a little paint. Because the rope was so hairy, uneven, and rather stiff, the volunteer was concerned that the quality of this manila was pretty poor. But, he persevered in his labors because this is what he had to work with. During the process of coiling and storing the lashing ropes, he became more and more concerned that this manila must be very old or something, because it was so dry and a whole lot less flexible than the lashing ropes he had provided Scouts for their projects in the past. Wondering if there was something he could treat the rope with to perhaps make it a little more flexible and soft, he set out to get some information from a rope expert. In the process, he contacted a real rope man from Louisiana who’s company distributed rope to bona fide suppliers. After this man learned that the rope was from China, it became very clear, the rope was not manila at all. Instead, it was sisal that had been color-treated to resemble manila. 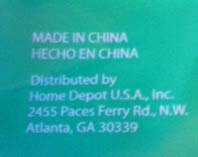 Pure manila rope comes from the Philippines. The man said the rope in question should NEVER have been sold as manila, but instead as “natural fiber” rope! “Pure manila rope is by far the best all-around rope. It is easy to handle, has good strength-to-size ratio, and does not have an objectionable stretch factor. It handles well in three important pioneering areas: knot tying, lashing, and in using a block and tackle. “Sisal rope has much the same appearance as manila rope, but it is quite inferior in strength and does not handle well when used for lashing or knot tying. When sisal rope that is tied into a knot or lashing gets wet and then dries, it becomes useless because of the kinks that remain. Please don’t be fooled. As for the poor volunteer who went through all the time and effort to prepare new lashing ropes and ended up with forty of lower quality, you gotta love him. And, after 80 applications, at least he’s now an expert at tying the sailmaker’s whipping.